I made summer rolls. It's not the easiest or quickest food to make but they are so good that when you're done you've forgotten how long it took to make them all. They are also a meal you can easily eyeball all the ingredients for, and this is how I cook and this is why I cannot bake. Details of my trials after the jump! First of all, you can eyeball and make up whatever you want inside. 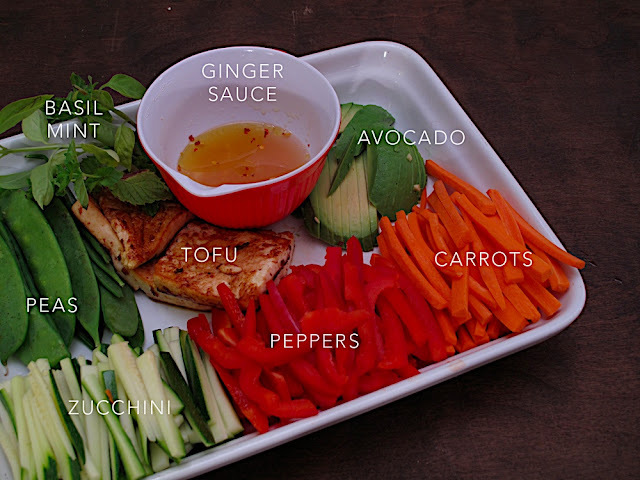 I went with peas, which I could buy as few of as I needed at the market; one zucchini; one red pepper; two carrots; one avocado; some sprigs of basil and mint from my sad window garden and a bit of tofu cooked in sesame oil and hoisin sauce. Being a live-er alone-er I really appreciate a market that I can buy just one of something from (take note, Trader Joe's). For the ginger sauce I diced up about an inch of fresh ginger and combined with the juice of a lime, a pinch of red pepper flakes and a splash of olive oil. I also made a peanut sauce for dipping, the ingredients are at the end of the post. Put on a show and get to chopping and prep all of your veggies. I cut them in about 3-3.5" sticks. Once all of the easy bits are done, fill a shallow pan with room temperature water and get your rice paper wrappers ready, this is the tricky part. Take one wrapper and place it in the water. Let the whole disk become covered by the water and pull it out. Give it a soft brush with your hand to get off excess water then pat onto a paper towel to remove the rest. The disk should still be have a bit of stiffness left in it at this point and place it on a plate to wrap. You can barely see it on the plate in this photo, it is clear and all. Next, assemble your ingredients and drizzle a bit of ginger sauce over them. I did this just slightly off center in one direction. Fold the edges of the wrapper in on the short ends of your ingredients. Fold in the top of the wrapper and then roll the ingredients as tautly as possible. The you'll have one (if you're like me, a sad and little) summer roll. Then you'll make a hundred more. This wrapping process is tricky and it took a while for me to get a hang of the correct amount of water on the wrapper and the best way to roll it. You'll rip some wrappers and some disks you'll find have holes in them and you can't use either, this must be why they seem to come 200 or so to a pack. The amount of ingredients I used yielded the plate of rolls seen in the first photo. Despite the challenge, it was fun and at the end of the day the perfection of your roll is less important as all of the flavors together and I love spring rolls so much. For dipping I made a peanut sauce, another eyeballed job: Take a spoon and put a large, heaping spoonful of chunky peanut butter in a small sauce pan. Add a rounded spoonful of hoisin sauce, a scant spoonful of sugar, a pinch of red pepper flakes and a bit of sesame oil. Heat on low heat just to combine.